“Word could not create the work file. Check the temp environment variable.” the basics. As soon as you edit a document in Microsoft Word, Word creates temporary files in the background. These store certain things as ‘recovery’ should Word get stuck or something like that. There is not a precise solution for this, so the tutorial consists of the solution that works for me and below that is a collection of Microsoft solutions. 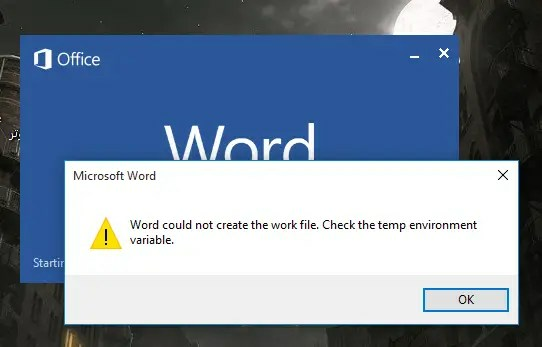 Word could not create the work file. Check the temp environment variable. The solution that worked for me. Go to start and search for Regedit. Or press Windows + R and type in Regedit. Search for the key below. You can also copy/paste this if you’re using Windows 10. If it’s not, please copy paste the location in the key. Because it is a computer setting you have to restart the device before it is applied. A solution from the Microsoft website. Go to start and open the explorer. Copy / paste the following location in Windows Explorer. Create a new folder (CTRL + N) and name it INetCacheContent.Word. Open Internet Explorer and go to the gearwheel. Under the General tab you see a box with Browsing History. Increase the Disk space to use to 1gb. The collection of forum posts where the other solutions are. Word: “could not create the work file. Check the temp environment variable”. Outlook: “could not create the work file. Check the temp environment variable”. Following a comment that the blog post is not clear, I adjusted it on 7-10-2018 with a better order. Do you have any other questions or comments? Then you can leave a comment. Thank you ! This one worked for me. Too much information. Not clear what you are actually suggesting to try. Also, I am not familiar with some of the technical terms.